The soft-tissue neck radiograph can be an extremely useful tool in a variety of clinical situations. These include: epiglottitis, croup, retropharyngeal abscesses, and localization of airway foreign bodies. 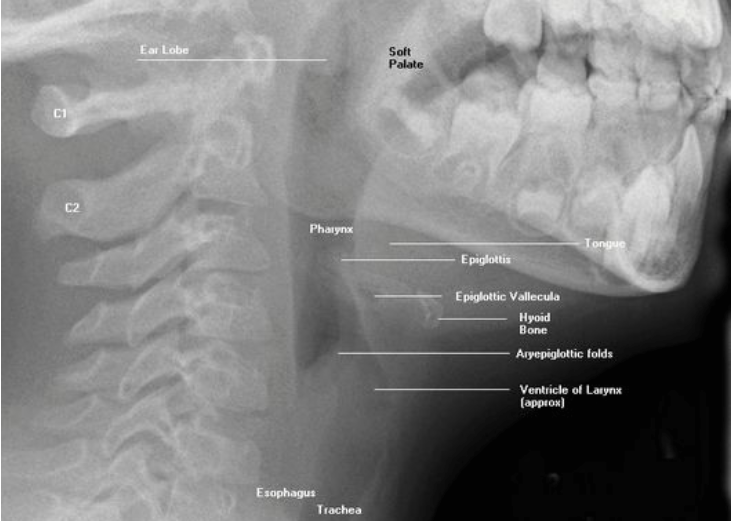 However, like any diagnostic tool, the soft tissue neck x-ray’s usefulness depends on knowledge of the relevant anatomy — particularly the normal size and appearance of various airway structures — as well as a systematic approach to each radiograph. We will discuss both the anatomy and radiographic approach in this blog post. This graphic provides a useful overview of airway structures. 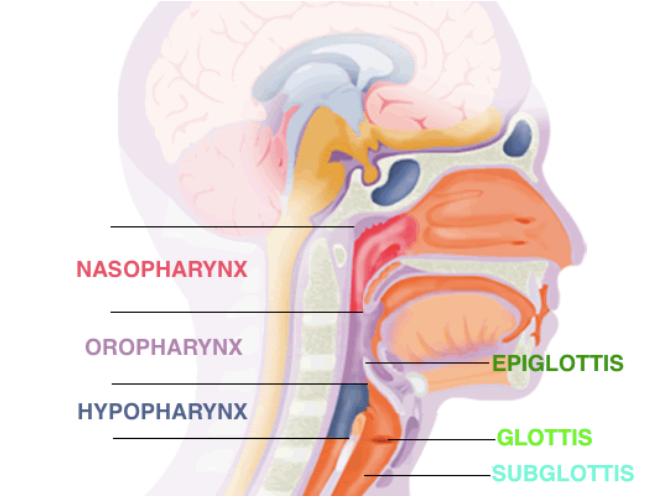 The most useful features in terms of a soft tissue neck XR are: the various pharynges (naso-, oro-, and hypopharynx) and glottises (epi-, sub-, and the glottis itself). Question 1: What structure is denoted by the number 3 on the image? Question 2: What structure is denoted by the number 4 on the image? Question 3: What structure is denoted by the number 6 on the image? See the Bottom of the Page for the Answers! Prevertebral space enlargement is an important and ominous sign of retropharyngeal space soft tissue infections, so it’s important to understand the normal widths for this space. The widths of the prevertebral space (asterisks), are measured in comparison to adjacent vertebral bodies. The prevertebral space anterior to disk spaces C1-C3 should be no more than half (50%) the width of the associated vertebral bodies. The prevertebral space anterior to disk spaces C4-T1 should be no more than the entire (100%) width of the associated vertebral bodies. A space wider than this is concerning for retropharyngeal abscess. 1. 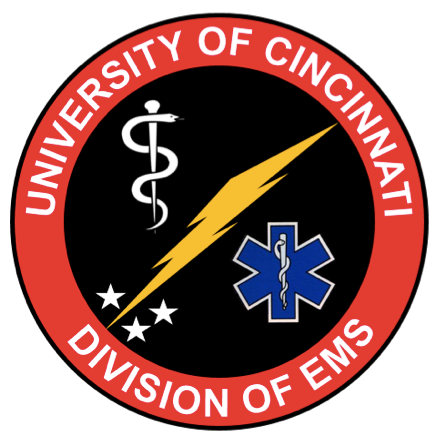 Confirm quality of study. In order to ensure the highest quality study, a soft tissue neck x-ray must be performed at end-inspiration and with the neck extended. These specifications maximize visualization of the airways and minimize false widening of the prevertebral space, respectively. Assess the hypopharynx. Is it normal or unusually wide? Assess the epiglottis. Is it normal or unusually large? Assess the subglottis. Is it normal or unusually narrow? Assess the prevertebral space (using the C1-C3 50% and C4-T1 100% rule). Is it normal or unusually wide? Particularly important if the prevertebral space is wide or borderline, assess the cervical spine lordosis. Is it normal or unusually straight?